I am delighted to participate in this conference 'Human Rights Matters!' marking Anti-Poverty Week 2012. I applaud Catholic Social Services Victoria, the St Vincent de Paul Society, Social Policy Connections, ACOSS, the Public Interest Law Clearing House, UnitingCare Community Options, and Women's Housing Ltd for this initiative. I note that some of the sponsoring bodies have been at the forefront of novel developments in human rights protection in Canberra. Countering the joint approach of the major political parties, you have been able to agitate the human rights ramifications of radical cuts to welfare payments made to 140,000 single parents of young dependent children who have now been placed on the Newstart Allowance which has not seen any real increase since 1994. But more of that anon. I have been asked to share with you some of the lessons from the National Human Rights Consultation which I was privileged to chair in 2009. Australia takes seriously its ratification of the key UN human rights instruments. Seven of those instruments require the Australian government to provide regular reports to UN committees about compliance and there is an increasing capacity for disaffected persons having exhausted all domestic remedies to bring their own complaints to the UN. In this case, it makes sense for our legislators to be apprised of these obligations before they legislate. Thus the dual approach — the provision by the executive of statements of compatibility and the Parliament's institution of a Committee on Human Rights. I was privileged to chair a committee of very competent individuals who had diverse views about how best to protect human rights in Australia. The other committee members were Mary Kostakidis, a well known national television news presenter and board member of leading humanitarian and cultural organizations, Mick Palmer retired Northern Territory Police Commissioner and Australian Federal Police Commissioner who had conducted the inquiries for the Howard government into unauthorized immigration detention, and Tammy Williams an indigenous lawyer whose family has been involved in litigation for the stolen generations and for stolen wages. We were also assisted by Philip Flood retired head of the Department of Foreign Affairs and retired ambassador who had done the review of the national intelligence services for the Howard government. The Murdoch press was fond of portraying us as a group of likeminded lefties. The diversity of our views ensured the transparency and integrity of our processes, especially given that we did not reach agreement on the recommendations about a Human Rights Act until five minutes to midnight. We utilised the new technology as well as conducting community consultations and receiving tens of thousands of submissions. I ran a Facebook page. We hosted a blog and commissioned academics on opposite sides of the argument to steer the blog debate on a human rights act. We held three days of hearings in Parliament House which were broadcast and oft repeated on A-PAC, the new Australian Public Affairs Channel — a C-Span type television station. During the consultation, groups like GetUp! and Amnesty International ran strong campaigns in favour of a Human Rights Act. However they largely abandoned the field once our report was tabled. The opponents of a Human Rights Act then went into action, including the Australian Christian Lobby and the influential leaders of the Anglican and Catholic Churches in Sydney — Archbishop Philip Jensen and Cardinal George Pell. The chief proponents of a Human Rights Act then seemed to be lawyers — easy targets, being identified as self-interested in generating further litigation. At community roundtables participants were asked what prompted them to attend. Some civic-minded individuals simply wanted the opportunity to attend a genuine exercise in participative democracy; they wanted information just as much as they wanted to share their views. Many participants were people with grievances about government service delivery or particular government policies. Some had suffered at the hands of a government department themselves; most knew someone who had been adversely affected—a homeless person, an aged relative in care, a close family member with mental illness, or a neighbour with disabilities. Others were responding to invitations to involve themselves in campaigns that had developed as a result of the Consultation. Against the backdrop of these campaigns, the Committee heard from many people who claimed no legal or political expertise in relation to the desirability or otherwise of any particular law; they simply wanted to know that Australia would continue to play its role as a valued contributor to the international community while pragmatically dealing with problems at home. The Committee learnt that economic, social and cultural rights are important to the Australian community, and the way they are protected and promoted has a big impact on the lives of many. The most basic economic and social rights—the rights to the highest attainable standard of health, to housing and to education—matter most to Australians, and they matter most because they are the rights at greatest risk, especially for vulnerable groups in the community. Colmar Brunton Social Research found 'only 10 per cent of people reported that they had ever had their rights infringed in any way, with another 10 per cent who reported that someone close to them had had their rights infringed'3. 10 per cent is a good figure, but only the most naively patriotic would invoke it as a plea for the complacent status quo. The consultants reported that the bulk of participants in focus groups had very limited knowledge of human rights. Sixty-four per cent of survey respondents agreed that human rights in Australia are adequately protected; only 7 per cent disagreed; the remaining 29 per cent were uncommitted. The Secretariat was able to assess 8671 submissions that expressed a view on the adequacy or inadequacy of the present system: of these, 2551 thought human rights were adequately protected, whereas 6120 (70 per cent) thought they were not. The majority of those surveyed also saw a need for better protection of the human rights of those living in remote rural areas. The near division of the survey groups when it comes to the treatment of asylum seekers highlights why the issue recurs at Australian elections. The Committee commissioned The Allen Consulting Group to conduct cost—benefit analyses of a selection of options proposed during the Consultation for the better protection and promotion of human rights in Australia. The consultants developed a set of criteria against which the potential effects of various options were assessed; the report on the outcome of this assessment is presented as an Appendix to the report.7 Each option was evaluated against three criteria—benefits to stakeholders, implementation costs and timeliness, and risks. The options evaluated were a Human Rights Act, human rights education, a parliamentary scrutiny committee for human rights, an augmented role for the Australian Human Rights Commission, review and consolidation of anti-discrimination laws, a new National Action Plan for human rights, and maintaining current arrangements (that is, 'doing nothing'). We put forward three tranches of measures to be considered for further protecting and enhancing human rights. I will deal with them in ascending order of controversy and in descending order of broad community endorsement. 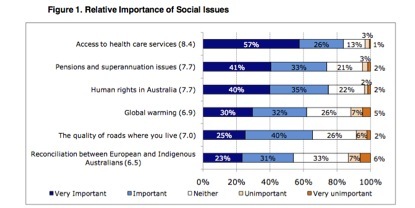 There is strong support for more education and the better promotion of human rights in Australia. It was apparent that few people have any specific understanding of what rights they do have, underlining a real need as well as a perceived need for further education. In the devolved consultation phase with vulnerable and marginalised groups there was a very consistent desire to have rights explicitly defined so that they and others would be very clearly aware of what rights they were entitled to receive. The second tranche of proposals for enhancing human rights protection included recommendations for ensuring that Commonwealth public authorities could be more attentive to human rights when delivering services and for guaranteeing compliance of Commonwealth laws with Australia's voluntarily assumed human rights obligations. We recommended that the Human Rights Commission have much the same role in hearing complaints of human rights violations by Commonwealth agencies as it presently has in relation to complaints of unlawful discrimination. The majority of those attending community roundtables favoured a Human Rights Act, and 87.4 per cent of those who presented submissions to the Committee and expressed a view on the question supported such an Act—29 153 out of 33 356. In the national telephone survey of 1200 people, 57 per cent expressed support for a Human Rights Act, 30 per cent were neutral, and only 14 per cent were opposed. If they do choose to take that extra step, we have set out the way we think this can best be done—faithful to what we heard, respectful of the sovereignty of parliament, and true to the Australian ideals of dignity and a fair go for all. Our suggestions are confined to the Federal Government and the Federal Parliament. The states and territories will continue to make their own decisions about these matters. But we hope they will follow any good new leads given by the Federal Government and the Federal Parliament. Part Four of our report deals with the issue of a Human Rights Act. It contains five chapters. First, it sets out previous attempts to legislate for a Human Rights Act in Australia and analyses why those attempts have failed. Second, it gives an overview of the statutory models in New Zealand, the UK, Victoria and the ACT. Third, it gives a dispassionate statement of the case for a Human Rights Act. Fourth, it gives an equally dispassionate statement of the case against a Human Rights Act. Fifth, it sets out the range of 'bells and whistles' that could be included in any Human Rights Act. This part of the report can stand alone as a useful resource for any citizen or Member of Parliament undecided about the usefulness or desirability of a Human Rights Act. The intended reader is the person who is agnostic about this question, not altogether convinced of the social worth of lawyers, wanting bang for the buck with social inclusion and protection of the vulnerable in society. I suspect few of the commentariat at Murdoch have read this part of the report. [T]hat sounds fair enough, but let us say Australia were at war. Now, in three of the wars that Australia has fought in — the First World War, the Second World War and the Vietnam War — the government of the day introduced military conscription. Now, if Australia were at war once again and the government of the day wanted to introduce military conscription, a person who objected to that might say, well, this is a violation of the prohibition against forced labour. So the decision about whether or not there should be military conscription in wartime would be a decision no longer made by the elected government, no longer made by the Parliament, but made by unelected judges. Another of the rights that Father Brennan recommends should be included in the Bill of Rights is the right to marry and found a family. Now, these rights obviously have to be enjoyed equally by everyone in Australia. We've been having a debate in this country for a few years now about gay marriage. Wherever you stand on the issue of gay marriage — whether you take a liberal view that there's nothing wrong with it, or a more conservative view that marriage is a relationship that can only really exist between a man and a woman — that is a decision that should be made by people whom the public elect, not by unelected judges. As you all know, our elected leaders decided to put a Human Rights Act on the long finger. But they did legislate to provide for statements of compatibility and for a parliamentary committee on Human Rights. The Commonwealth Parliament's Human Rights (Parliamentary Scrutiny) Act 2011, having passed the Senate on the final sitting day last year and having received royal assent over the summer, came into effect early this year. The Australian Parliament has now appointed a ten member Parliamentary Committee on Human Rights which is required to examine Bills and legislative instruments 'for compatibility with human rights'. It is chaired by ex-speaker Harry Jenkins. The Committee may also examine existing Acts and inquire into any matter relating to human rights 'which is referred to it by the Attorney-General'. 'Human rights' are defined to mean 'the rights and freedoms recognised or declared' by the seven key international human rights instruments on civil and political rights, economic, social and cultural rights, racial discrimination, torture and other cruel inhuman or degrading treatment, including the Conventions on women, children and persons with disabilities. Anyone introducing a Bill or legislative instrument to Parliament will now be required to provide 'a statement of compatibility' which 'must include an assessment of whether the Bill (or instrument) is compatible with human rights'. So at a national level, the Executive and the Legislature cannot escape the dialogue about legislation's compliance with UN human rights standards. Neither can the courts, because Parliament has already legislated in the Acts Interpretation Act that 'in the interpretation of a provision of an Act, if any material not forming part of the Act is capable of assisting in the ascertainment of the meaning of the provision, consideration may be given to that material'. Parliament has provided that 'the material that may be considered in the interpretation of a provision of an Act' includes 'any relevant report of a committee of the Parliament' as well as 'any relevant document that was laid before, or furnished to the members of, either House of the Parliament by a Minister before the time when the provision was enacted'22. Clearly reports of the Parliamentary Joint Committee on Human Rights and the statements of compatibility provided by the Executive will be relevant in court proceedings in determining the meaning of new Commonwealth statutes which impinge on internationally recognised human rights and freedoms. Victorian lawyers should be well positioned to providing the new parliamentary committee and the courts with assistance in utilising these new interpretative mechanisms. The committee considers that the preparation of a statement of compatibility should be the culmination of a process that commences early in the development of policy, and not as a 'tick-box' exercise at the end. In this way, a statement of compatibility can reasonably be expected to reflect in appropriate detail the assessment of human rights that took place during the development of the policy and the drafting of the legislation. The statement of compatibility should take the objective of the proposed legislation as its point of reference, identify the rights engaged, indicate the circumstances in which the legislation may promote or limit the rights engaged and set out the justification for any limitations, in an appropriate level of detail, together with any safeguards provided in the legislation or elsewhere. [T]he committee has considered nine bills introduced during the period 14 August to 23 August 2012 and 146 legislative instruments registered with the Federal Register of Legislative Instruments between 23 July and 22 August 2012. The committee notes that one bill appears to have been introduced without a statement of compatibility. The committee considers that this bill does not appear to raise any human rights concerns. However, the committee will draw the Minister's attention to the requirement in the Human Rights (Parliamentary Scrutiny) Act 2011 that each bill and legislative instrument introduced into the Parliament must be accompanied by a statement of compatibility. Statements of compatibility must be provided for all bills and all legislative instruments regardless of whether the proposed legislation is considered to raise human rights issues or not. whether and how the limitation is proportionate to that objective. ACOSS made a spirited and well researched submission to the committee that the Social Security Legislation Amendment (Fair Incentives to Work) Bill 2012 failed to comply with international human rights protections including article 9 of the International Convention on Economic, Social and Cultural Rights which recognizes 'the right of everyone to social security, including social insurance'. ACOSS was joined by the Australian Human Rights Centre, the National Council of the St Vincent de Paul Society, the National Welfare Rights Network, the Welfare Rights Centre and the National Council of Single Mothers and their Children. The Department considers that the measure maintains a person's right to social security as per article 9 of the International Convention on Economic, Social and Cultural Rights (ICESCR), as that right has been interpreted in the General Comments on the ICESCR (see particularly paragraphs 9 to 27). In Australia only 50 per cent of single parents are in work, well below the OECD average of 60 per cent. Single parents make up around 70 per cent of jobless families. Through this bill the government seeks to provide greater incentives and opportunities for Parenting Payment recipients, particularly for single parents, to re-engage in the workforce and to provide greater equity and consistency in the eligibility rules for Parenting Payments. The committee considers that these are legitimate objectives. However the committee notes that it does not necessarily follow that the measures seeking equity are justified, as it is not apparent to the committee that the government has considered any alternative options in this regard. With regard to the question of whether there is a rational connection between the measures and the objective, the committee's examination of the available evidence indicates that this is not a matter that can be conclusively proven up front. The committee considers that on balance, the government has provided sufficient supporting evidence to suggest that the proposed measures may go some way in achieving the stated objectives. However, the committee considers that the lack of decisive evidence highlights the need for appropriate monitoring mechanisms to accompany the proposed changes. The committee notes that it is not apparent that the government has taken steps to establish post-legislative mechanisms to evaluate whether the measures are indeed achieving their objectives or to monitor their impact on individuals and groups, particularly with regard to the risks of hardship and discrimination. The committee notes that proportionality requires that even if the objective of a limitation is of sufficient importance and the measures in question are rationally connected to the objective, it may still not be justified, because of the severity of the effects of the measure on individuals or groups. To date the committee has requested further clarification in relation to 16 bills and seven instruments considered in its First, Second and Third reports. The committee has received responses to six of these requests and is therefore waiting for responses in relation to 12 bills and five instruments considered in its First, Second and Third Reports. This falls well short of the committee's expectations and I urge the Ministers, Members and Senators concerned to take urgent action in respect of any outstanding responses. I would like to emphasise the desirability of the committee considering such responses prior to the conclusion of the Parliament's consideration of the legislation. It is a source of disappointment to the committee that two of the bills for which it has sought further information have now been passed by the Parliament. Notwithstanding the passage of these bills, the committee still expects the relevant Ministers to provide a response to the committee's request and will be writing to them accordingly. The committee does not want to see Statements of Compatibility outsourced to legal specialists, nor does it want them to be seen as mere procedural hurdles at the end of the drafting process. The committee wishes to see consideration of human rights genuinely elevated in the policy development process. The committee considers that the requirement for Statements of Compatibility has the potential to instill a culture of human rights in the federal public sector by integrating the consideration of human rights into the development of policy. Cultural change requires patience and constructive support. For its part the committee intends to approach its role in a considered and responsible way by seeking to foster an effective dialogue with the Executive and Departments. I urge all who represent the interests of poor and disadvantaged Australians to familiarize yourselves with the workings of this committee. It is not a sole preserve of lawyers. Human rights language can be helpful in agitating questions of equity and social justice, especially when the major political parties are competing to bring in a budget surplus. This committee provides you a place at the table, even when seeking protection of economic and social rights including health, housing, education, and social security. The above text is from Fr Frank Brennan SJ's address 'Advancing human rights in Australia — lessons from the National Human Rights Consultation' at the 'Human Rights Matters!' conference marking Anti-Poverty Week 2012. 17 October 2012, Cardinal Knox Centre, St Patricks Cathedral, Melbourne. Please remember that all persons have the right to life from the moment of their conception to their natural death.